VISIT US ON FACEBOOK AND GOOGLE!! Everyone at this office is absolutely amazing! Dr. Gaudry was excellent. He explained in detail (I like that) what he was doing and what to expect. Very happy with this experience. They are SO nice there. Dr. K answered every one of my questions, even the silly ones. He has a wonderful, calming manner, and a good sense of humor. Dr. Gaudry was awesome. He explained everything that was going to happen during the procedure. Excellent patient care. Dr K explained each step of the procedure as he was working. His Tech Torie was very good too. Dr K called me at night after the procedure just to check on me. Highly recommended for any and all of your Endo work!! Office was able to get me in quickly, Dr. Gaudry fully explained entire process and options, very professional and thorough thru procedure, pain management was exceptional for entire procedure. Add on the fact that this physician served our country proudly, a team that can't be beat! Entire office staff/ancillary staff were exceptional! Dr. Kalchthaler and staff - Overall a GREAT experience! The experience in your office was fantastic. Everyone was helpful and pleasant. I can say that I do not like having a root canal, but the experience there makes it much better. I appreciate the professionalism of each and every person in the office. Dr. Gaudry is wonderful and very courteous and professional. His calm and quiet demeanor puts you at ease. The flowers are a nice touch too! Dr. Kalchthaler Excellent dental surgeon. Explained everything before and as it happened and fully discussed the options available to me. I could not have asked for anything more from a dental surgeon. A little word of thanks....for a whole lot of nice! Thank you for the great experience I had in your office. The words "Root Canal" were dreaded by me but after my visit in your office I have different feelings. Thank you to a wonderful office and staff. Our office was the first endodontic practice in the Knoxville area to incorporate the use of microscopes as well as digitally captured x-ray images. Microscopes provide an excellent view inside your tooth during treatment allowing the doctor to treat problems in a much more meticulous way. Digital x-rays provide greatly enlarged images of the teeth and allow each image to be captured with far less radiation to you. Most patients have places they would prefer to be other than a dental office. Some have had bad dental experiences in the past and have significant anxiety. We like to learn from you what special needs you have and customize our approach to your care. Our goal is to give you technically excellent care in a way that leaves you with "spring in your step" when you leave and greater confidence in your ability to have a good dental experience in the future. We have online collaboration with referring dentists. This allows us to send your dentist x-rays and details of your care in real time. This reduces delays and miscommunications regarding your care. We employ the latest barrier techniques and follow ADA, CDC, OSHA and TOSHA guidelines relating to infection control. We use 2 autoclaves that are monitored by Blount Memorial Hospital to insure our instruments are being properly sterilized. We recycle as much of our office waste as possible and have upgraded our equipment to reduce the amount of water we use. Since 1992 each patient treated has been given a fresh flower upon completion of their visit as a symbol of our dedication to make your visit as comfortable and as pleasant as possible. We are located on High Street, not far from the Blount County Courthouse and Ft. Craig Elementary School. The office is surrounded with mature trees and a stand of bamboo which provide pleasant views for the picture windows in the reception and patient care rooms. The trees also provide habitat for birds, squirrels, and a groundhog. WE are a short drive from Knoxville, Lenoir City, and Sevierville. Over the years the staff and doctors of Foothills Endodontics have participated in serving those with unmet dental needs by participation with Remote Area Medical, Good Samaritan Clinic, Blount Smiles, Trinity Dental Clinic and Donated Dental Services. 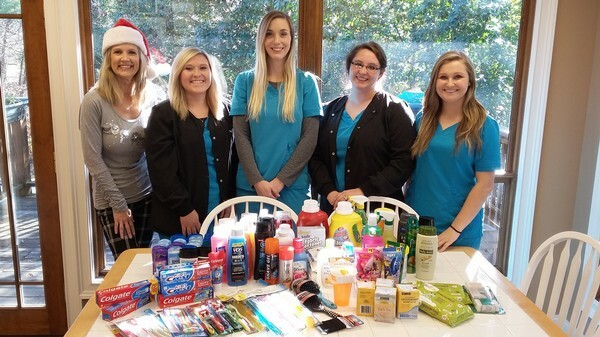 Giving back to local charities has become a tradition to the staff here at Foothills Endodontics. Every year our office chooses an angel tree or organization to purchase toys and needed items for. We each took much pride in hand picking these gifts for "Toys and Things for Blount County Society" this year in 2015. We look forward to our next opportunity to GIVE a little piece of happiness.